Depending on the task to be solved the script will use one of the three available main branches of Sonargraph’s model tree. The parser model, which is basically representing the physical aspects of the software system like source files, root directories and programming elements rooted in their physical home, which usually is a source file. The two other branches are based on a logical model. The logical model skips physical aspects and only contains logical elements like namespaces/packages and programming elements like classes. The first variant also still retains modules while the second variant only makes a difference between internal and external elements. Your own code base defines all the “internal” elements, while all elements that referenced by your code based without being defined in your code base are considered external. Since we want to find packages/namespaces spread over more than one module we will use the logical branch with modules. To solve our problem we will create a map that maps namespace/package names to the modules where they occur in. Each namespace that belongs to more than one module after we have visited all namespaces will get a warning marker. So let’s begin creating a script. 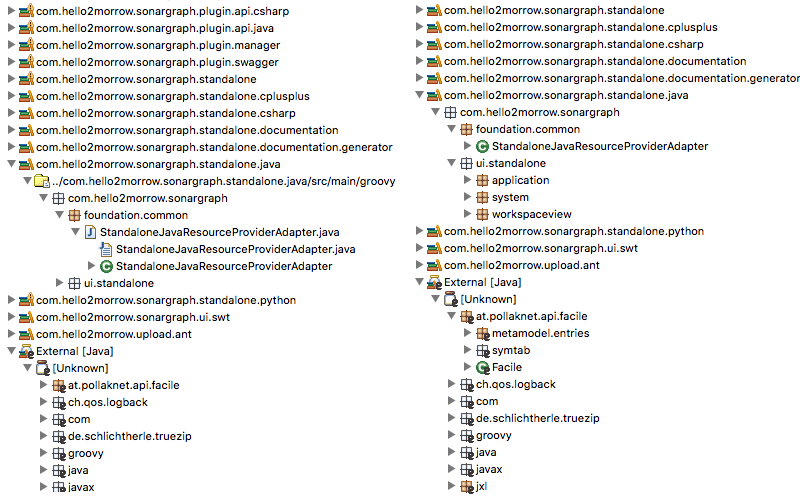 Navigate to the “Files” tab (top left section) in Sonargraph-Architect and right click on “Scripts”. A popup menu will appear where you can select “New Script File…”. We give a name to our script and are happy with the fact that only “Core” is selected for languages. Our script will be language agnostic. The editor will show some example code which you can delete, we won’t need it for our purposes. In line 2 we create the all important visitor object by utilizing the global variable “coreAccess” which represents our software system. From line 7 on we define a closure that is executed for each instance of “LogicalModuleNamespace” in our software system model. The visitited instance is passed as a parameter named “ns” (line 9). Before defining the closure we declare to global maps, “namespaceMap” and “distributesPackages”. The first map will map namespace names to a list of modules, while the second one is just use as as set to remember the names of all distributes namespaces. In line 17 we are testing for “part” namespaces. 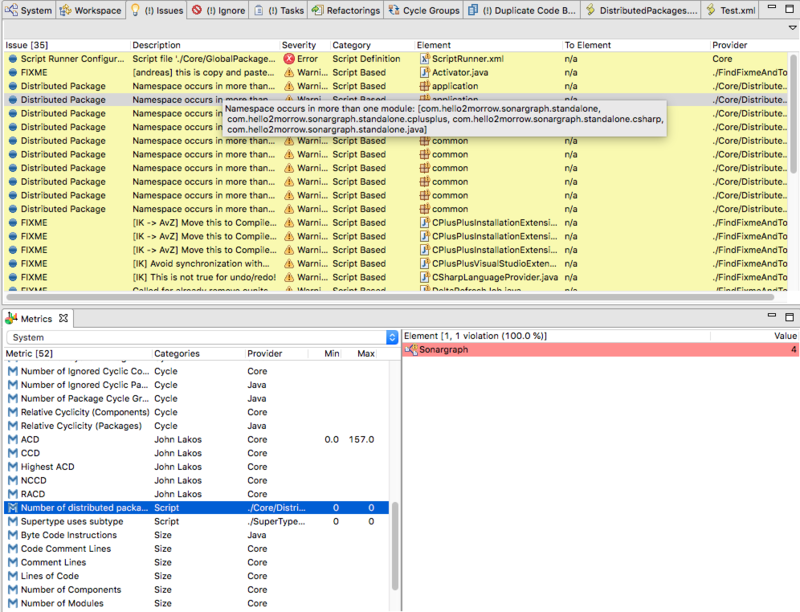 Those are namespaces that do not contain any classes or other programming elements, but only nested namespaces. We skip those because they would just lead to irrelevant false positives. The remaining code should be pretty self explanatory. Just notice the call to “visitChildren” in line 32. This is very important, otherwise we would only visit top-level namespaces and never reach nested namespaces. This next section adds another closure that allows us to skip all external elements by not calling “visitChildren” inside of the closure. Line 41 starts the tree visitation process. After this call returns our two global maps will be filled with the needed data. msg = "Namespace occurs in more than one module: $moduleNames"
The purpose of this loop is to make use of our results. For the script view we will create a result tree that will associate distributed package names with all the modules they occur in. Moreover we will add issues to the distributed logical namespace objects. At the end we will also add a metric to Sonargraph that counts the number of distributes package names in a software system. The “good” range will be zero to zero, we consider distributed packages as a bad thing. A good practice to develop scripts is to use “println” statements in your code. Those will go to the console view when you run the script. When everything works as expected you can remove the “println” statements.The editor also supports code completion by pressing Ctrl-Space. After our script is polished we can add it to the automated script runner of Sonargraph-Architect, i.e. the script will run automatically after each refresh and will contribute issues to the Sonargraph issues view and metrics to the metrics view. The script runner configuration can be accessed via the “System/Configure…” menu. Once it is added to the script runner the script will also run during automated builds with Sonargraph-Build or in our plugins for Eclipse and IntelliJ. Now we have come to the end of our litte example. Please leave feedback or questions in the comment section below. If you want to try our scripting engine yourself you can obtain a free evaluation license from our website and try it on your own project. The script above is part of our core quality model and can be used out of the box with Sonargraph-Architect.